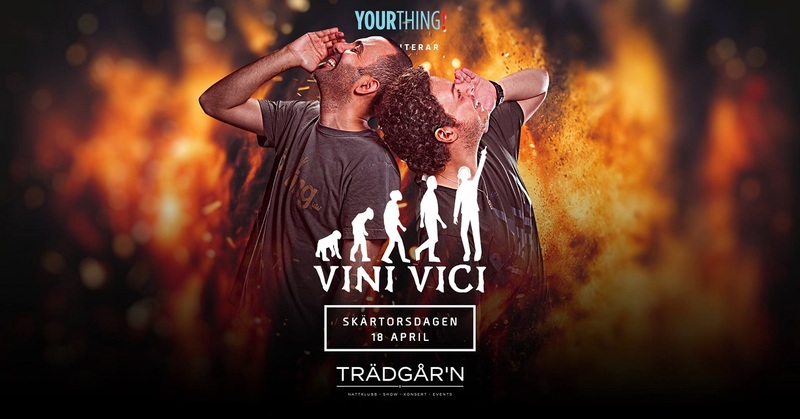 Your Thing presenterar VINI VICI lördag den 18 april på Trädgår’n! Vini Vici is the new project of Aviram Saharai & Matan Kadosh, both well-known and experienced electronic music producers for over a decade. The concept of Vini Vici was formed by the boys with an intention to express their love for the old school sound, paired with their progressive ideas. Iboga Records and FM Bookings, widely considered to be the biggest psytrance label and booking agency, were the first to see the potential of the project and invited them to be part of their well respected family, alongside names such as: Ace Ventura, Liquid Soul, Ticon, Captain Hook, Atmos, and the like. After the huge success of their premier EP ’Divine Mode’ and their follow-up ‘Back Underground’, ‘Expender’, ‘Anything & Everything’, and ‘Veni Vidi Vici’ tracks (all top sellers on Beatport and Iboga Records charts), Vini Vici continued to produce massive hits while touring the world nonstop – Brazil, Mexico, South Africa, Switzerland, Finland, France, India, Denmark, Germany, United State, Italy, Portugal, Austria, Australia, Serbia, Netherland, Scotland, United Kingdom, Ireland, Israel….. It’s no surprise Beatport positioned them at No.3 on the Top Artist list of 2014.